LAVAL – The Montreal Canadiens officially announced on Monday that the city of Laval will welcome an American Hockey League team that will make its home at Place Bell in Laval beginning with the 2017-18 season. The new state-of-the-art venue is scheduled to open its doors in the fall of 2017. At the AHL annual meeting, League President David Andrews indicated that the Board of Governors approved the relocation of the St. John’s IceCaps from Newfoundland to Laval beginning with the 2017-18 season. The American Hockey League (AHL) is a 30-team league that serves as the primary developmental league for the NHL. Founded in 1939-40, the league was a stepping stone for several of the NHL’s brightest stars. As president of Place Bell in Laval, Vincent Lucier will be responsible for the overall management of the venue. An experienced executive who played a key role in both customer service and ticket sales at the Bell Centre since it first opened in 1996, Lucier climbed the ranks within the Montreal Canadiens management team after joining the organization as a ticket office clerk 20 years ago. After four years as manager, from 2001 to 2005, he was promoted to director of ticket sales and was subsequently named vice president in 2011. Among his numerous achievements, he successfully supervised a major ticketing system transition in 2008, switching from Admission to Outbox, a new label ticketing system, introduced the ticket vault and a client portal for season ticket holders, and was responsible for the implementation of mobile tickets. Lucier holds a Bachelor of Business Administration (B.B.A) from HEC Montreal and a Master’s degree in strategy and management from the Université Paris-Dauphine, France. 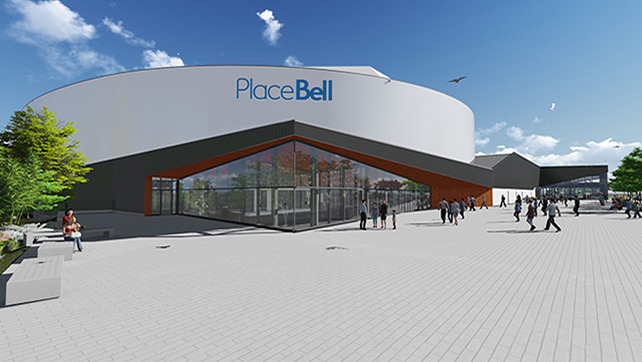 A multipurpose facility that will host a broad spectrum of events, Place Bell will provide the city of Laval and its citizens with a unique experience. With its 10,000-seat main arena, a standard NHL ice rink and a total of 46 private suites, Place Bell will be the home of the Montreal Canadiens’ AHL affiliate team beginning with the 2017-18 season. Place Bell will also feature a community rink and an Olympic size ice surface. An elaborate facility, it will have the capacity to host an array of events, including concerts, family entertainment as well as community and corporate events. It will also feature a commercial area with various retail stores on two storeys. “I am very pleased to welcome the Montreal Canadiens’ affiliate team to Laval. I am certain that every Laval resident will soon develop a tight bond with their new team. We look forward to working together and moving forward with the evolution and success of this team. The arrival of this exciting professional sports entity will not only bring in major economic returns, but it will also introduce an element of identity for our city. This team will bring a sense of social cohesion and pride for our community,” said Laval Mayor Marc Demers. Laval has a rich and successful hockey tradition. Over the past decades, it saw talented young prospects like Michael Bossy, Vincent Damphousse and Mario Lemieux entertain Laval hockey fans before starring at the NHL level. Laval has also been the home of coaches like Bob Hartley and Michel Therrien, who were successful behind the bench of their teams. The Montreal Canadiens are asking hockey fans, and most specifically fans in Laval, to enter names for the team’s main affiliate. The “name the team contest” is a fun way to incorporate the Laval community as an integral part of this team’s brand and design. The contest is divided into three stages. To enter a submission, log on to www.placebell.ca starting July 11, 2016. Throughout phase 1, from July 11 to 22, 2016, fans can enter their suggestions along with a short description. Each entry will be judged based on creativity, originality and tie-ins with the city of Laval and/or the Montreal Canadiens. During phase II, from July 26 to August 8, fans will vote for the entries judged the most appealing among all those submitted. The final phase, from August 15 to 31, fans will be asked to vote for one of the three finalists. The winning name will be announced in the fall. The winning entry will receive a pair of season tickets. A second pair of tickets will be randomly selected among all who participated in the second and third phases. Rules and regulations can be found on the web site www.placebell.ca. Fans interested in season tickets for the new professional hockey team in Laval can also log on to www.placebell.ca and enter their name.